Continuing the discussion on road safety in Mumbai city, EMBARQ India recently analysed data about road accident fatalities and serious injuries obtained from the Mumbai Traffic Police (and the Traffic Training Institute, Byculla). With the report in its final stages, this blog post will serve as a summary of major findings, starting with an overview of the safety problem in Mumbai, and going into specific issues on the safety of auto-rickshaws in Mumbai. A final comment on location-specific concerns for road safety is also included, to highlight areas where road fatalities are concentrated. The impact that growing motorization (driven by cars and two-wheelers) is having, if any, on the safety of auto-rickshaw occupants. The study also provides evidence for the claim that pedestrians, cyclists and motorcycle occupants (drivers/pillion) are the most vulnerable to road accidents leading to death. 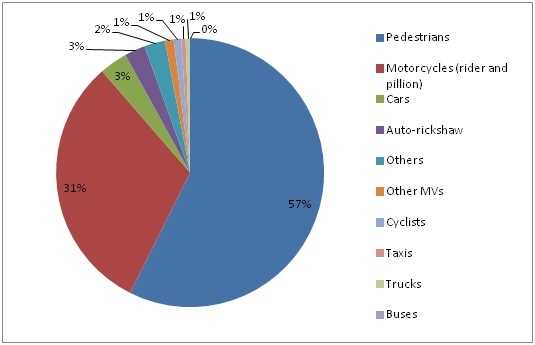 From 2011 data, of 563 fatalities, 323 were pedestrian fatalities (a whopping 57% share in total) and 176 were motorcycle occupants (31.2% of total). In light of these findings, there were only 14 auto-rickshaw occupant fatalities. 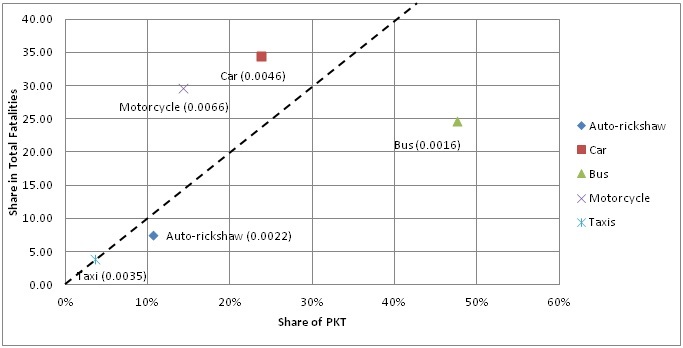 Similar PKT analysis for occupant fatalities showed that cars, taxis, auto-rickshaws and buses had less than PKT-representative share in occupant fatalities (indicating that they are less vulnerable as road users). Motorcycles, however recorded the greatest vulnerability among these motorized passenger modes of travel. Auto-rickshaws, while safer than motorcycles, were found to be at greater risk of road accident fatalities relative to taxis and cars. It is speculated that this is due to poor safety features in vehicle design, slower moving speeds, and sharing space with faster and heavier moving motorized means of transport among other factors. These trends are illustrated in the form of the below pie diagram. Finally, the location-wise analysis showed key areas requiring dedicated safety reform in Mumbai. While there was separate data available on accident-prone zones in Mumbai, this analysis showed that areas like Vakola (119 fatalities in the last 5 years), Goregaon East (87) and Nehru Nagar (80) were potential concern areas. 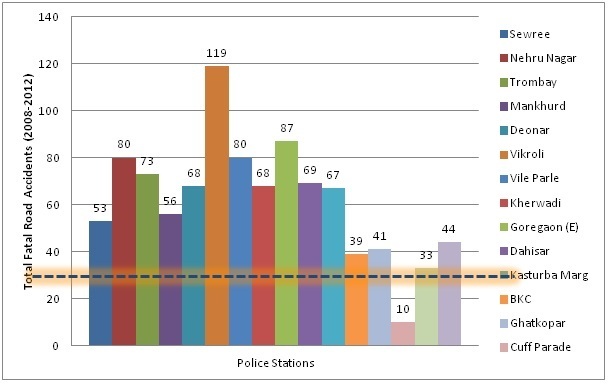 Overall, police stations along the Eastern or Western Express Highway reported a high number of fatalities, indicating proximity to fast-moving roadways to be a possible reason. More specific data would greatly improve the context of this analysis, potentially even helping to find if there were accident-prone areas specifically for auto-rickshaws. This speaks volumes on several aspects of road safety in Mumbai, and about the safety of auto-rickshaws. 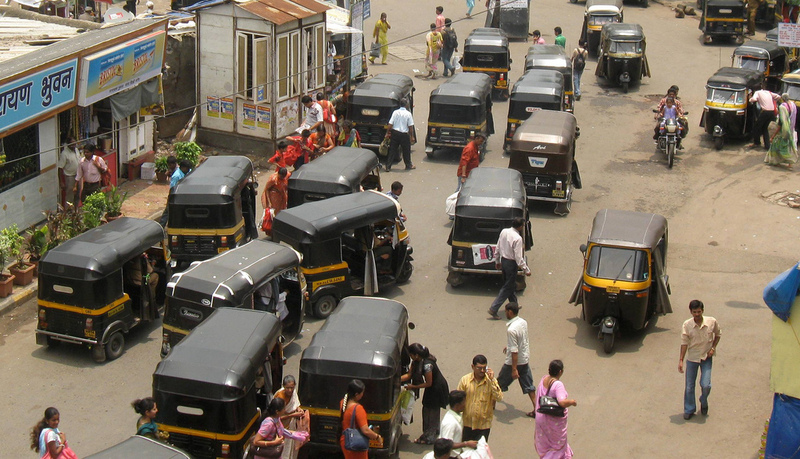 Since auto-rickshaws are allowed to ply only in the suburban areas of Mumbai city, this may significantly impact their exposure to road safety risks. Furthermore, contribution to fatalities may often not be solely due to the vehicle and/or its driver – there may be defective road design features or weather conditions that have also had a part to play in road accident fatalities. Greater depth in data, along with efficient means of extraction will greatly aid the cause of better analysis and understanding of the safety problem (as mentioned before). In closing, it is important to note that auto-rickshaws were neither major contributor to fatalities, nor were their occupants at the most risk. While this may not paint a complete picture of the problem, it does offer some evidence to previously intuitive dialogues. The idea is to enable safety reform for auto-rickshaws and other vulnerable road users (like pedestrians and motorcycle users) at the soonest. This can be best done through effective road design, better incentives for drivers, and optimizing vehicle design to ensure safety of all passengers.